None of us likes the idea that a business crisis could be in the offing. However, at some point, you will be on the verge of disaster with your business. This isn’t necessarily the end of the world. If you are prepared ahead of time, you are more likely to weather the storm. You might even come out ahead and learn a few valuable lessons. You want to be ready with a firm financial foundation before your business crisis. As much as you are able, shore up an emergency fund or arrange for capital. Liquidity and access to capital are vital in any situation. Take a look at your finances now. You want to fix any money problems now, before the unexpected hits. This includes your personal financial life. 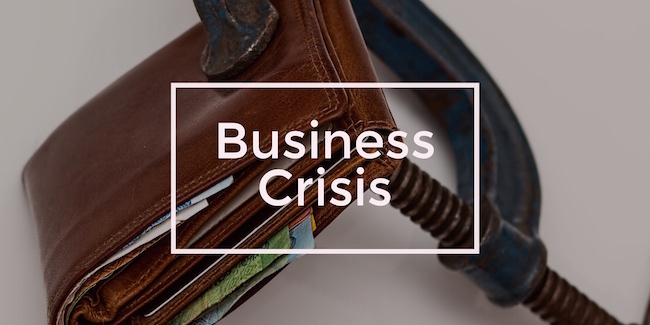 You don’t want to end up in a situation where your personal finances suffer and you struggle because of a business crisis. Do what you can to prepare ahead of time. That way, you’ll be less stressed in an emergency situation, and you’ll have a bit of a buffer to see you through. My ex-husband teaches psychology at the graduate level. He talks about the “emotional bank account” we all have. The idea is that you build goodwill, building up the emotional bank account. Then, when you mess up or hurt someone’s feelings, there are good vibes in there. You have an established relationship and you are likely to get through the situation. The other person (friend, lover, child) is more likely to forgive you. The same concept applies when you have a business. Work on being an exceptional company and building goodwill with your customers and others. Do what you can to live by your mission and provide great customer service. When a business crisis hits, people will be more willing to give you the benefit of a doubt and forgive you. They are more likely to stand by you — as long as you show that you understand you messed up and you are working to make amends. Start now to build goodwill so that you have a good stock of it later. Rather than just react in a business crisis situation, you need to be aware of your own responses. Pay attention to how you feel. Also, pay attention to your physical responses. Are you going to fight-or-flight mode? If so, that can be a cue that you need to take a step back. Pay attention to how you handle situations now. This will help you make better decisions later. When you get used to being mindful of your responses, you can identify problems that can trigger rashness on your part. When you are aware that what you want to do is react immediately or lash out, you can stop that impulse. Practice taking deep breaths and waiting to respond. You might feel like you need to do something immediately in a business crisis, but often the best thing to do is take a few minutes to get a little more information and go from there. Once you know what you are doing, and what to expect from yourself, you can prepare for just about anything. You’ll be able to view the situation more objectively and find the lessons.